Home > Used Vehicles > 2009 Subaru Forester Touring,AWD,SUNROOF,ALUM WHEELS,AIR,TILT,CRUISE,PW,PL,LOCAL TRADE,!!!! 2009 Subaru Forester Touring,AWD,SUNROOF,ALUM WHEELS,AIR,TILT,CRUISE,PW,PL,LOCAL TRADE,!!!! Cylinders: 2.5L H4 16V MPFI SOHC - 4 cyl. Hurry on this one! Marked down from $12900 - you save $1000. This 2009 Subaru Forester is for sale today in Edmonton. This SUV has 160250 kms. It's camellia red pearl in colour. It has an automatic transmission and is powered by a 2.5L H4 16V MPFI SOHC engine. 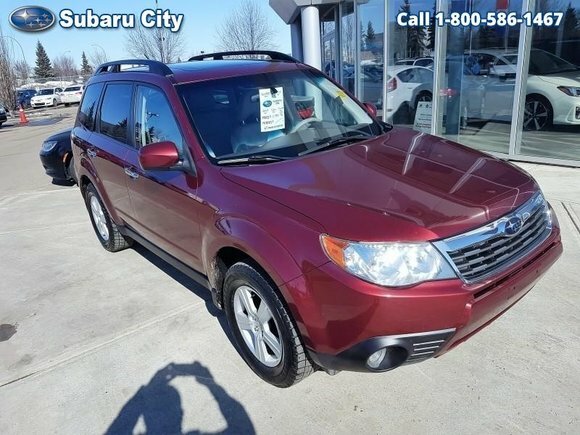 Want to try the 2009 Subaru Forester Touring?